Check List Type entity is what you can use to set up different types of checklists. Once you’ve imported the solution, start by setting up a few check list types and some check lists items for each type. Finally, add ita_checklistcompletion attribute (string, 2000 characters) to your entity – this is where check list selections will be stored. Publish all, create a record of that entity type, make sure to select check list type for that record, and switch to the “Check List” tab. 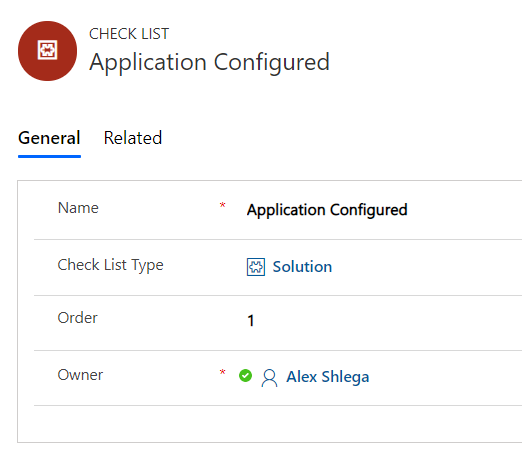 The web resource will start loading; it will query check list items through Web API (and that query will be filtered to only return the items which have selected check list type); and it will display them in a list. Once some items have been selected, those selections will be stored in the ita_checklistcompletion attribute, so the next time somebody loads the same record, all selections will be preserved. Line 57 of the html file is missing the “*” selector to insure that the box-sizing property is applied to all elements. Also, in the function PrepareList(), there is a big chunk of code commented out. Why is that? Hi, thanks for the “*” note – will update the solution. As for the commented code, there is a piece of code in the original w3schools sample which I did not need in the web resource version. It’s all about allowing users to remove individual check list items from the list by adding “x” button besides each check list item. There are other ways to implement the checklist where this kind of button would make more sense, but it does not seem to be very useful in this version(the checklist is not maintained on a relationship), so I just commented it out for now.